I like this one because when my worgen has the glyph of the sentinel it matches! So decided to do something good with my old pet charms and started purchasing some of the pet from the vendors that my friends that pet battle don't have. 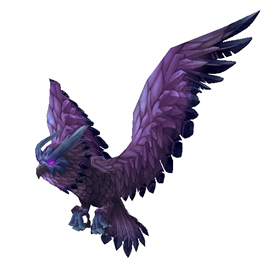 Why is this the only non cagable pet that the vendor sells? Anyone know if blizzard acknowledged that this is a bug? Nov. 29th I bought one in Dalaran and it was a Rare quality. I suppose I got lucky unless they are all Rare now. P/S Breed, I think that may be the only breed. As a battle pet, it seems like a duplicate of several existing pets...? I got a grey one :( I got all the others from the vendor at the same time and the rest were all Rare quality. Mine was also Common quality, and I noticed I wasnt able to cage it only release. I made a ticket and the GM made it rare for me. I received a common as well. Glad I saved up some stones from garrison dailies! I also got a grey (Poor) quality swooper instead of a blue (rare) one. Mine was uncommon instead of rare. I suspect that they're having the 'random rarity' issue with these. Other who also got a Grey instead of Rare?